I have a question that a few of my friends are struggling with now as we're pregnant with our second child. What's the best way to introduce a young toddler to your new baby and how can you make the first weeks/months go smoother? Preparing for another child is always an exciting time for a family. 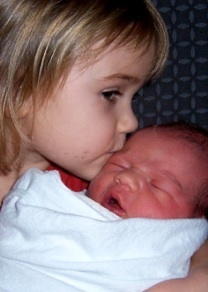 Fortunately, most older siblings adjust well to the birth of a new baby. 1.) Get the child involved. Talk them about the baby and your changing body. Ask them if they want to feel the baby kick. Refer to it as their baby or our baby. Take them to doctors visits (when possible) and let them hear the babies heart and see the ultrasound. 2.) When we were pregnant with our second we found the book Zaza’s Baby Brother by Lucy Cousins. It is a great book to prepare an 18 month to 3 year old for a second child. 3.) Gifts - After the birth of your newborn, have the new siblings exchange presents. On the way to the hospital to meet their new baby, have Dad take the older sibling to pick up a simple present for the baby. When they give their gift to the baby have the baby give them a present (something to keep them busy in the hospital) as well. 4.) Let them hold their new baby. To make this as safe a possible try a “double wrap”. Swaddle the newborn in cotton swaddling blanket and then again in a fleece blanket. We find this give the baby padding and stability. 5.) Don’t blame the baby. Don’t say things like “Mommy can’t read you a book as she has to feed the baby”. Do say things like “Lets read a book right now and then Mommy will come upstairs and give you a kiss goodnight”. 6.) Get your older child ready. If the plan is to move the two year old to a big boy bed do it at least a couple months before your due date. To avoid the toddler claiming ownership of the crib, pack it up. When you bring out the crib close to your due date it will now be the “baby’s bed”. 7.) Be positive. Many parents feel like they are taking away from their first born by “daring” to have a second. This simply isn’t the case. Your children’s relationship should last beyond your lifetime and help them in life’s rough times. When your son has girlfriend trouble in college he won’t call you, but he may call his brother.